New Road Guest House is an authentic backpacker hostel and hotel conveniently located in Bangkok’s traditional Bang Rak neighborhood. Whether you stay in one of our comfortable dorms or our traditional-style private hotel rooms, you’ll enjoy an experience designed to help you meet others planning their Asian adventure, relax in a family-style environment and discover one of Bangkok’s off-the-beaten path neighborhoods. Nestled alongside Bangkok’s Chao Phraya River, Bang Rak is one of the city’s oldest districts. Hundreds of years ago, the first foreign embassies and trading houses established themselves along the banks of the river and Thailand’s first modern avenue, Charoen Krung. Today, Bank Rak is a bustling destination with Bangkok’s busiest pier (Saphan Taksin) and a combination of local markets, authentic street food vendors, trendy bars and cosmopolitan restaurants. It is easily reached through both the BTS Sky Train (Saphan Taksin station) and underground MRT (Surasak station). 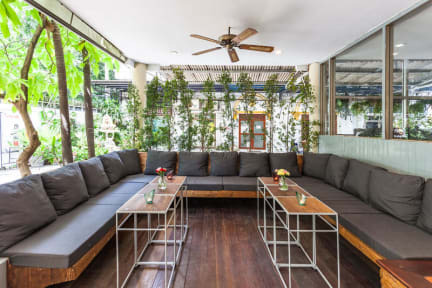 New Road Guesthouse is a 5-minute walk from Lebua State Tower and is famous sky bar, a 10 minute walk to the Robinson’s department store and a 10 minute tuk-tuk or taxi ride to the Asiatique Riverfront. On the northern side of Bang Rak is Bangkok’s Chinatown and its famous street food as well as the gateway to the town’s oldest settlement, where you’ll find the traditional tourist sites like the Grand Palace and Wat Pho. It is also the gateway to the rest of Thailand through the nearby Hua Lamphong railway station. Nice tidy reception. Good location just a short walk away from china town, also close to boats which I would recommend for travel very cheap! Would recommend Siem House for dinner around the corner. Beautiful local food for extremely cheap price. Only negative would be we found our room left unlocked after cleaners had been in, apart from that a lovely stay landing into South East Asia. I think we found the only place in Bangkok without AC. When I asked for an extra pilow, the answer was: no can do. Don't buy the breakfast, it's not worth the money. Just stayed for one night. The staff was really nice and they helped me a lot to find good dentist in the area around. The showers could be a little cleaner and the rooms aber okay. The WiFi was good and I really liked the social area. They play nice music :) But it’s far away from the real city centre where Khao San Road and the Chinamarket is. Nice hostel, quite quiet - definitely not the best if you want to party but it was really good just to chill and have a quiet time - a few young families staying. Aircon in our room was not good - we had it set to 16 degrees C and couldn’t feel it at all. Staff were really lovely and helpful. Only stayed for one night, decent location. Stayed in 10 bed mixed dorm. Beds were comfy but no duvet - was given an old brown towel as a blanket. Room could get quite hot as AC only used from 6pm - 10am. Lockers were a good size. Toilets were dirty most of the time and showers you deffo needed to wear flip-flops!! Locations was good, close to sky train station and walking distance to china town and many temples. Overall I wouldn’t stay again- nicer hostels for same price in Bangkok.